During the current presidential election campaign, the five most prominent candidates — President Viktor Yushchenko, Premier Yuliya Tymoshenko, opposition leader Viktor Yanukovych, Front for Change leader Arseniy Yatsenyuk, and businessman Serhiy Tihipko — all established an Internet presence as part of their election campaign strategy. According to media assessments, however, the Ukrainian candidates have not understood the intricacies of Internet marketing and therefore have not used the web in an effective manner during this election campaign. Internet use is growing rapidly in Ukraine and future candidates’ sophistication in the use of web tools will likely increase out of necessity. Media claim that the candidates do not understand the “intricacies of Internet marketing” and therefore do not use the Internet effectively in promoting their candidacies (Delo, 24 November). According to the business analytic weekly Vlast Deneg, the presidential candidates use the Internet “in such an awkward manner that it harms their ratings instead of attracting more supporters.” According to Oleksandr Olshankyy, who sits on the board of the Internet Association of Ukraine, “the candidates generally do not encourage feedback from users and offer static information such as press agency releases or photo galleries. And the ‘common mistake’ of all the candidates is that they do not make any postings personally, they leave it to their staffs to do so; this tends to discourage users” (2 November). 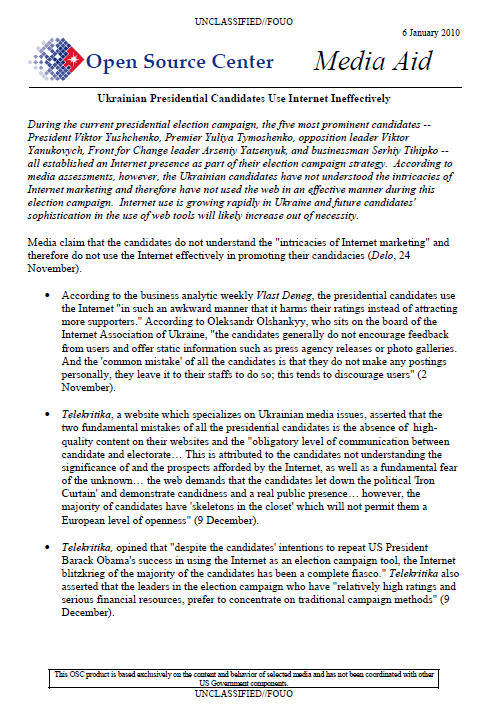 Telekritika, a website which specializes on Ukrainian media issues, asserted that the two fundamental mistakes of all the presidential candidates is the absence of high-quality content on their websites and the “obligatory level of communication between candidate and electorate… This is attributed to the candidates not understanding the significance of and the prospects afforded by the Internet, as well as a fundamental fear of the unknown… the web demands that the candidates let down the political ‘Iron Curtain’ and demonstrate candidness and a real public presence… however, the majority of candidates have ‘skeletons in the closet’ which will not permit them a European level of openness” (9 December). Telekritika, opined that “despite the candidates’ intentions to repeat US President Barack Obama’s success in using the Internet as an election campaign tool, the Internet blitzkrieg of the majority of the candidates has been a complete fiasco.” Telekritika also asserted that the leaders in the election campaign who have “relatively high ratings and serious financial resources, prefer to concentrate on traditional campaign methods” (9 December).